The closet door is slightly ajar and I notice my daughter staring at it. I know instantly what is happening but I ask anyways. Her answer is some sort of generic denial, but I see it in her eyes: fear. It may be irrational to some that a tiny area filled with clothes would be capable of terrorizing someone mentally, but it's honest and real. We all have those buttons that we never want pushed, the specific concepts either based on fantasy or facts that send a chill down our spine. For her it's a creature derived from imagination from a mind too young and naive to realize what doesn't exist cannot hurt you. For me it's the dangerous possibilities of reality. It's the motivations of the deranged. I believe in monsters too. From director Mike Flanagan comes a new horror film Hush, a Netflix original that is simple yet disturbingly scary. 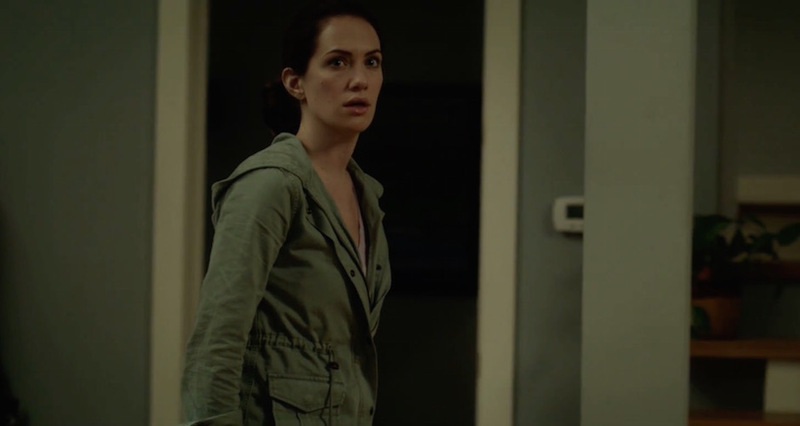 Maddie (Kate Siegel) is a deaf and mute writer living in a nice home in the woods, a solitary life by choice. I will spare you the details of how it all goes down because that's much of what leads to that ugly, uneasy feeling in your stomach as you witness it unfold, but this is a new entry into the home invasion sub-genre that has a way of destroying my nerves and consuming me with a level of fear that makes me nauseous. The added wrinkle here is such an experience from the perspective of Maddie, a voiceless woman in a soundless world at a time when one absolutely wants to hear what's coming. Being afraid of the dark takes on a whole new meaning when the only thing that can save you is your sight. One of the most interesting choices from Flanagan is the way he uses sound, a means to actually allow us to experience what it's like to be Maddie rather than just tell us her condition through storytelling. Early on we are in the room when the smoke alarm goes off and the sound and flashing light pulses the frame, a sensory experience that is designed to be jarring, yet from the perspective of Maddie it's actually somehow worse. The silence in that moment is deafening as I sat there thinking about her vulnerability. Being afraid of the dark is quite common because it's unsettling to have to wonder what could be lurking in the shadows that light would otherwise expose. Some scenes in the film were actually too dark visually, which can be a bit frustrating while watching but I believe this was done intentionally for additional realism. We are seeing what Maddie would actually see, not an artificial lit set piece, and the disorienting nature of relying on our vision to pierce through the darkness of night only invokes an even stronger feeling of anxiety. The only real issue I took with the film started when a new character enters the picture and the predictability factor started to kick in, which to that point it had completely avoided, but Hush still managed to utilize plot devices like the memory of her mother's voice and Maddie's desire to fight until the bitter end as ways of maintaining a certain unique vibe to the film and fleshing out her character nicely without her having to say a single word. Hush has a way of making every window feel like a threat rather than a welcoming gateway to the outdoors. I took a second during the film and became frighteningly aware of just how visible I was and I was overwhelmed with a sudden desire to lower all the blinds and check the locks. When the man outside first appears, he is masked and the imagery of him watching her is horrifying yet something about his look felt cliched, following in the footsteps of a history of horror cinema depicting masked killers. When he removes it and we see the face of reality, as if an inhuman entity suddenly becomes a personification of pure evil, his existence is far more terrifying. He is played by John Gallagher Jr., a wonderful talent seen in films like Short Term 12 and 10 Cloverfield Lane, and the fact that he is recognizable didn't subtract an ounce of fear from my rapidly beating heart because the scariest thing in the world is knowing that his character isn't the creature hiding in the closet. He is the monster that I believe in. The type that actually exist. It's why I close the closet when I know my kid is afraid. It doesn't matter if it's rational or not, we all are afraid of something and we all long for the comfort of knowing we are safe. 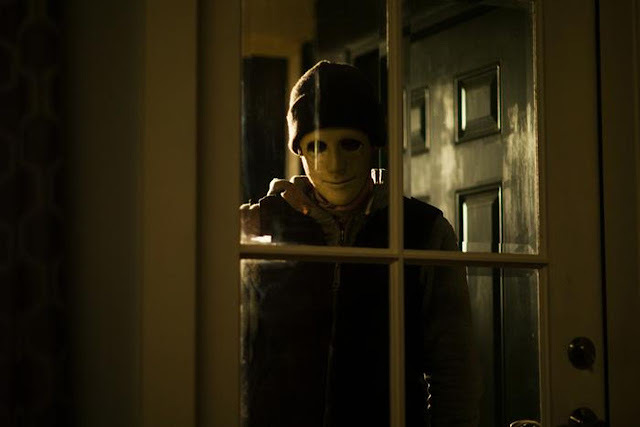 Hush may not be perfect cinema, but it's a rush of tension and terror that just may have you leaving a light on late into the night thanks to focused low budget filmmaking and intelligent plotting involving such characters and circumstances. I tried to remind myself it was just a movie, but I'm sure I had that look in my eyes. The genuine fear of the unknown and what could be. Hush is effective enough to push that button. I hope it went well for you Tina! Let me know your thoughts. Well, I've never heard of this movie, but I'm sure glad you did! I just watched it and wow, just wow. Really makes me thing that there's still a little faith for the horror genre out there. I'm honestly shocked that this hasn't been a staple in horror since it's such a simple yet brilliant idea. Two things were going through my mind watching this: "dude just break the glass, the house is made of it!" and "why are you running? you know you're too slow and at a disadvantage!" but luckily I was corrected later in the film when the killer wails on the glass and I'm like "Damn~ that's some mighty fine glass!" All in all this is a gem, a beautiful lovable little bit of a film. Since you recommended this, I feel like recommending a little something too. It's on netflix, and it's called Mountain Men with Tyler Labine (one of my all time favorites) about two brothers bonding and being trapped on a mountain. It's really good. Yeah I will admit I had some thoughts about the glass and why didn't he just break it, but early in the film I felt like that would have gone against the little game he was playing, that it was a challenge to get her but he was determined to prove he could do it. As she put up more and more of a fight I expected him to try and sure enough as you said, he did. Ah I really enjoy Tyler Labine but I have never heard of Mountain Men...I will absolutely take a look at that, thanks Cody! Glad you enjoyed Hush. Sounds like a good movie I'll have to check out.